My favorite part of Bill Plaschke’s latest column in the Times, which I’ve been rubbernecking since Tuesday night – I mean, there’s such a perverse pleasure in it; it’s like perspective fell down a well, and news trucks from all around the country have come to cover the dramatic rescue attempt – is this. Plaschke is so gung-ho about his mission to bench Yasiel Puig that he thinks you need to make plans to do it over and over again. Plaschke somehow managed to top the magical illlogic earlier in the same column, “For every playoff game that Puig wins with his bold arm or crazy legs, he could cost them two,” a statement that shows that as much as Plaschke claims to see the big picture, he misses it entirely. 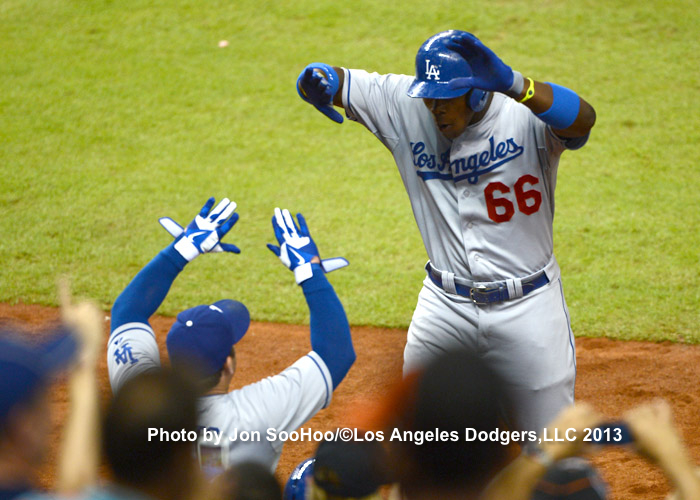 Man of character Nick Punto greets Yasiel Puig after his tiebreaking home run. Look, even most of those who thought a punitive benching of Puig was an overreaction would concede that a day off to collect himself might not hurt. There are obviously aspects of Puig you’d like to see improve, and leaving him out of the starting lineup Tuesday was sensible timing. But when you argue in print that a 22-year-old ballplayer, after 2 1/2 months in the major leagues, is so lacking in character that you “desperately” need a mechanism to keep him in line – weeks from now, over and over again, because the initial punishment or his natural development has so little chance of working – you’ve revealed to the world your bias against him. And it’s a nice touch to ignore the irony that the Dodger you name as your savior is the last one you pilloried in the press. Even Plaschke’s seemingly rational request that Puig “be allowed to grow into the game” misses the mark, ignoring the fact that this player, who 14 months ago was in the midst of a long layoff from competitive baseball on any level, has shown preternatural ability to do just that. If Plaschke just took a breath and thought about all the things Puig does right, that no observer of the Dodgers had any right to expect in August 2013, he might not be so alarmed and devastated that yes, mistakes do happen, on and off the field. Every parent, to use one analogy, wants to protect and instruct their children from making mistakes that could cause them harm. There’s plenty I’d like to see my kids do better. But ideally, I evaluate their weaknesses alongside their strengths, I don’t let their shortcomings blind me to their sheer wonder, and I certainly don’t plan for their continued ignorance. And I understand that the best way to learn is to learn by doing. But don’t give up hope. Perspective might yet make it out of the dark, cold pit. I give Don Mattingly a healthy chance of ensuring its rescue. I get the feeling that Plaschke was placed one too many times in a closet as a kid (and that he thinks that it did he some good). Plaschke is a softy. I say the bench is too good for him. Send him back to Chattanooga! Why would you send your best player (since coming up) back to the minors during a playoff race? Idiotic. I like the guy and all, but I am persuaded by the math. For every win he costs me two losses. WAR says otherwise: He’s worth a 3.8 WAR through 68 games, or an MVP level 9.05 WAR for a full season. I can’t let this go on anymore. It’s killing me that Kevin isn’t realizing Bob is being sarcastic. and me as well. Sorry Kevin, I violated Rule 7. I would suggest you’re being facetious rather than sarcastic. Sarcasm isn’t a strong suit of mine, with English being my second language. I blame Plaschke for making it seem plausable. From the very beginning, I have detected a large degree of condescension, and yes, blatant racism in the conversation around Yaiel Puig. We were told by Steve Lyons in an early broadcast that Puig is “smarter than you think”, and “more intelligent than we’d been led to believe”, and he’s repeatedly described in various quarters as a “wild man”, as if he was raised by wolves. And now Plaschke, the self-appointed “Moral Conscience of Our Times”, the hack who’s never met a cheap column idea he couldn’t appropriate, has chimed in. Oh yes, we must keep the wild man on a leash, he must not be allowed to knock over the furniture or pee in the house. The whole thing is a sad commentary on what passes for the “informed media” these days: it’s just a bunch of jackasses looking for their 2 minute sound bite on ESPN. Plaschke still considers Mark Ellis the key to the Dodgers resurgence. Because he has an intense stare. Almost always enjoy your occasional contributions but this one is silly. If you replace black with Latin it would be less silly as a description of prejudice in the U.S.
I’ll agree to disagree with you here, although I concur it would be just as accurate if applied to Latino players. No…context is the key. I have heard Vin use similar descriptions for many players…including Kirk Gibson. 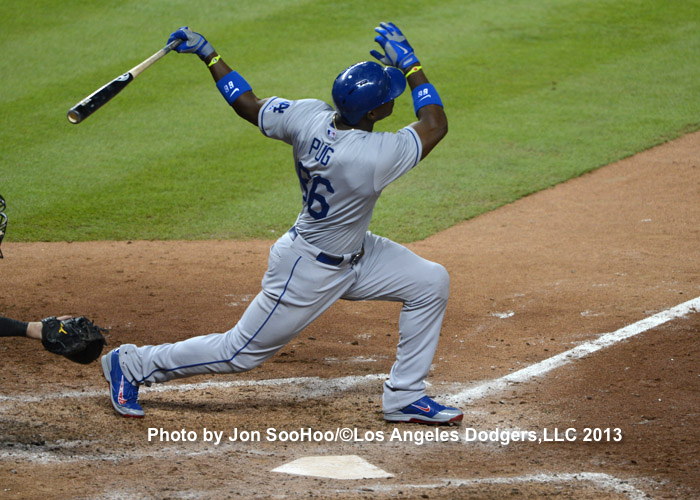 There’s no doubt there’s a racial undertone to some Puig criticism. so many pundits needing so many columns. is what many seem to feel should be the case. embarrassing the galactically slow AGon ahead of him on the basepaths). after being counseled about things that clearly are wrong, then criticism would be more justified. Right now it mostly seems way overdone, like much of what over-reactive media does these days. negative coverage some places, if he won’t play that game. all the better if it’s controversial. I thought yesterday’s column was bad and then Plaschke did the writing accomplishment of going for a 2 point conversion when your team is trailing by 28 in the fourth quarter. If I had an obelisk, Plaschke would be the first name on the list. I refuse to read any column by him. I have a backup obelisk. You’ll probably need it soon. Your primary obelisk has to be running out of space by now. I’ve long since stopped believing that Plaschke believes what he writes. He just drivels whatever sounds provocative or evocative to him and collects his checks. Responding to him is like debating with TJ Simers. Or your dog. Proud days LA Times. My dog is far more sensible. The thing about Plaschke is he is, undeniably, a talented feature writer. His 1988 remembered pieces this year are truly enjoyable. If that were what he did full-time, I’d have an entirely different attitude toward him. I agree. He is a very talented writer and he has occasionally evoked emotion from me even as I know that is his sole aim. Beyond that, i knew him personally years ago and I liked the guy. But it’s frustrating that he doesn’t use his skills to write columns he believes in. I know this to be the case because he consistently flips his columns viewpoints to the side which is easier to write about with some fire. Next week will surely bring the “fire Mattingly for benching Puig” column. I can’t read his stuff any more. It makes me all kindsa mad! No Win Above Replacement in that substitution! It put a huge smile on my face seeing Puig plant a big kiss on McGwire’s cheek yesterday after his homerun. My guess is that Mac has been working with him the last few days and Puig thinks it paid off. If he is someone that is willing to work hard with his coaches to make himself better, then you want him on the team in those situations where he is going to learn the most. Kershaw will be the first one to tell you he had a lot to learn in his first few years, so does that mean you bench him??? No way do you bench 2 or 3 years ago Kershaw, or Puig, for a stretch run or the playoffs. I think Mattingly probably did the right thing to let him collect his thoughts and let the work with McGwire sink in for a day and watch the game (which turned out to be an even better idea since he showed up late), but that’s at least something worth discussing as opposed to this silliness. Saw and liked that as well. So I didn’t see what I thought I saw? KT will have the tape. Looked again, more of a hug I guess (but a kissy one). Just rewatched it. He goes up to Mac twice. The first time is a hug and then later, after he party’s with Hanley, Mac says something to him as he’s about to put his stuff away and he goes up and gives Mac a hug and a kiss on the cheek (well maybe he misses with the kiss, but tries at least). I’m probably reading too much into it yes, but he does give Mac special attention and Mac gives it to him, so that is good to see. I suppose the precarious state of newspapers these days means it’s hard to get good columnists to work for them, but the LA TImes sports desk is singularly afflicted with two jerks in Simers and Plaschke. Snarkiness (in Simers’s case) has its place, but it’s better suited for blogs than it is for newsprint. I get the sense Plaschke is just playing out his string hoping to survive the next calamity to hit the paper with his job intact, so he writes rehashes of old columns. Miami has got to be a major distraction for Yasiel. Its been a long time since he has seen so many Cubanas in one place (and back then, he wasn’t a millionaire). He has a house there that he bought either for his parents or for his mother (I have seen the former reported originally, the latter a few times since including a quote from Puig. For all I know his father is still in Cuba.). He is staying there while the team is in Miami. Pretty sure that both of his parents are out of Cuba at this point. Puig’s family lives in Miami now. Whatever the case, those needing Puig stories are missing what could be a great one about his parents. No, Plaschke is NOT a talented writer. A talented writer wouldn’t come up with crap like this. The best approach to Plaschke is not to publicize his drivel. You know what they say: Don’t feed the troll. I link to Plaschke about once a year. There are times when I think the response is worth the link. My link to him will do very little to feed page views at the Times, but my response to him I hope will counter, to whatever small degree, the viewpoint. 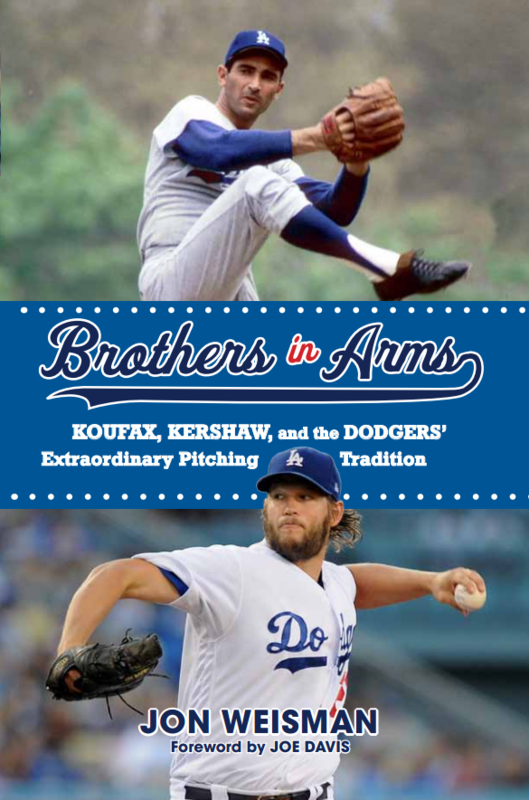 I agree that Plaschke is a talented feature writer…when he is writing about puppy dogs, kids with terminal illnesses, and ancient baseball scouts. This is to say he is essentially a one trick pony. Knew Zack was doing well. Just didn’t know how well. Wow! PLUS his contributions at the plate! What the heck is Puig doing in there ?!?!? Especially the way Uribe has been hitting lately. Ha! He is making a joke out of it. Bench him! Every once in a great while, Plascke will write a decent column – the one about the old scout (If that was Plascke, I can’t remember) that ran on the front page was good – but, yeah, for the most part he’s garbage. Great day for #llws. Two great games Tijuana at 1pt then Eastlake at 5pt. Jon, I just want to thank you for your consistently great Dodger commentary. I would think I’m going crazy if all I had to rely on were the LA Times, ESPN LA, etc. It was a little scary when it looked like Dodger Thoughts might cease to exist last year, so please, keep up the great work! The Dodgers tweeted a photo of Puig (in uniform) that say 3:18 pm. But it could be doctored…. Just was reading about Ichiro nearing 4,000 hits between US and Japan, and then saw that has over 2,700 hits in MLB. Amazing! I wish he came to us with Nomo and then Hiroki. Are he and Jeter first ballot HOF? Not that I follow the Yankees often. I certainly believe Ichiro is a Hall of Famer, though with this voting group who can know about “first ballot”. At his peak, he did everything, except hit for power. Jeter certainly will be 1st ballot. The Giants sure are giving the Red Sox a tough challenge. Down 12-1 today they will lose 2 out of 3 by a combined score of (at this writing) 21-4. Then it appears BoSox have tomorrow off while Dodgers have to play early game and then travel across country afterwards. But at least Friday’s game is an evening one so hopefully it won’t matter much. Look up “sportswriter” in the dictionary. There’s a picture of a sloppy guy with a pot belly, well past playing age, with a face and nose that’s strangely red, and whose voice scratches glass. Plaschke keeps making the same mistakes in logic and reasoning and ignorance of baseball over and over again. Perhaps he is the one who needs to be benched. I’m sure there are some decent sportswriters out there who might like his platform. But then again, the benching worked! Puig was so chastened that he showed up late and hit a homer.